Crowned as one of the most beautiful beach destinations in Turkey, the Mediterranean resort town of Marmaris offers the ultimate escape. 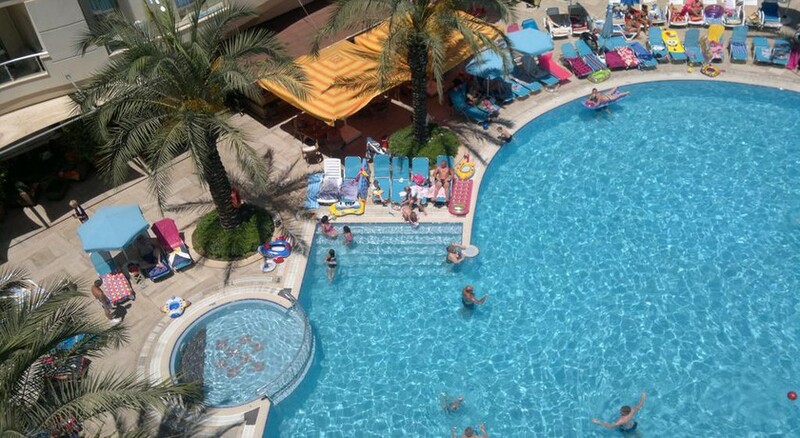 Located along the Turquoise Coast, the cosmopolitan resort is a short hop from the beach and leisurely seafront promenade, while the nearby town is dotted with upbeat restaurants, shops and bars. Cosmopolitan Resort Hotel is perfect for accommodating family holidays, featuring 155 tasteful apartments and suites with comfortable living rooms, well-equipped kitchenettes and private balconies to match – alongside upbeat lounges, restaurants and multiple swimming pools. The hotel has an all inclusive package for dining, which allows its guests to sample a wide range of culinary options too – from exotic Mediterranean to wholesome Italian. The Alara Day Spa at the hotel offers traditional Turkish hammam, along with scent-infused steam rooms and dry saunas if you wish to be pampered, while children can have fun at the kid's club. You'll have round-the-clock entertainment including live performances, dance lessons and sporting activities at your hotel, or if you want to explore, Marmaris' bustling city centre can be reached within a 5-minute drive. 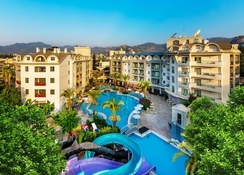 Cosmopolitan Resort Hotel is located on the northern side of the beach town of Marmaris, Turkey. The nearest airport is Dalaman airport, which is situated at a distance of 89.2km and it takes approximately 1 hour 14 minutes to reach the hotel. The public beach is 1km away meaning your sunshine holidays in Turkey can be spent on the sand. The hotel offers its guests 155 family-suite rooms, with 2 presidential suites and 2 rooms suitable for handicapped guests. The rooms are carefully designed to accommodate a minimum of two people, up to larger size families. 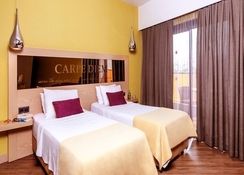 Each room has a double bed or two single beds, a comfortable living area and a kitchenette. All of the spacious rooms are equipped with sofabeds, refreshments such as coffee and tea, refrigerators and cooking facilities. The superior rooms are equipped with new furniture and tasteful decor. The cleaning and changing of linens are done on a daily basis. Cosmopolitan Resort Hotel serves up a wide selection of cuisines to indulge in during your stay. The two a la carte restaurants and stylish lounges cater to all tastes, with a selection of Turkish and Italian inspired meat, seafood and vegetarian dishes on the menu – plus delicious patisseries from the on-site bakery. The hotel's swimming pool is undoubtedly the main attraction. It's a free-form pool with a variety of waterslides for kids to splash in. There is also a relaxation pool and a whirlpool for adults. After a fun-filled day at the pool, guests can enjoy daily evening shows as part of the hotel's entertainment – as well as lively Anatolian dance repertoires, theatrical performances and comedy classics. There are also spectacular pool parties showcasing fireworks and live musical performances. If you prefer a slower pace, you can also enjoy a sophisticated evening at one of the two hotel bars, Pool Bar and Blue Moon Bar. The kid’s club organises a variety of games for children, which are both educational and fun. Finally, the Alara Day Spa houses a traditional Turkish hammam, along with scent-infused steam rooms and dry saunas for ultimate R&R. I read the reviews after I had booked this hotel. I literally felt sick. I’ve been going to Armutalan in Marmaris for years and thought I would have a change of location. This was my first holiday without my son so I was really looking forward to chilling and having an adult holiday with my partner. I was dreading arriving. On arrival all we wanted to do was drop our bags in our room and head to the local bars as we were on a late arriving flight. The staff on arrival were amazing. Really helpful and friendly. I originally thought the guy had attitude however it was just his English. The room was fabulous even if we didn’t have a great balcony view. It was exactly what we needed. A massive living area, massive bedroom and great bathroom. All lovely decorated. Cleaned everyday and if we wanted we could have had towels everyday. The housekeepers made lovely designs each day which was fabulous. Both pools were great however due to us not having our son with us we spent most of our time at the front pool. The mojito bar staff were fabulous and friendly. Always up for chatting. The food was great. We are not fussy eaters and nor did we go to turkey to expect English food so we always found something to eat. No offence but if your looking for English cuisine stay in the uk. The only meal we did have an issue with was breakfast. It was the Turkish version of a British fry up and it’s not what I was looking for. We generally are out for breakfast. We used the local tour guide to book our tours and our visit to the spa. The spa was great. Totally recommend it. All our tours we booked were second to none and very well priced. Highly recommend Jeep Safari and Boat Trips. Both myself and my partner used the in hotel Barber more than once. Great friendly guy and his wife was lovely too. I had the gold plated facial and also my hair washed and blow dried for going home. My partner had close shave all over, ears, nose and eyebrows done. Amazing job. Every time we walked past they waved and smiled or stopped to talk to us. We are booking to return for longer next year. Don’t listen to the British who are looking for English seaside holiday. This place was great. Fantastic family holiday, food options were plenty but not my cup of tea so ate out quite a lot, facilities great and could not fault the hotel room for the price we paid ! Would and will definitely be staying again !! Enjoyed my stay at this hotel as it was made that bit better by TJ the barman 👌🏻. Food was good rooms cleaned to a high standard every day. There are 2 pools with bars, one for family's which was a lot busier and a quite one which we used. The only down fault was the beauty parlour would pester you for treatments. would stay again. First time starting all inc, ale rubbish and food was average. Hotel was nice and clean, staff nice and polite, entertainment more for kids then adults. Saying that I would stay again. This was amazing hotel the food was brill and it was different every day. The staff was all really friendly and the hotel was spotless.